I should preface this article by saying that I am "young" (well, in my early 30s physically - mental age varies) and I am a nerd. That means I've written more lines of code than I care to remember, can traverse a balanced tree data structure on a whiteboard, and I like to read books on things like graph theory. It's terribly interesting stuff, honest. 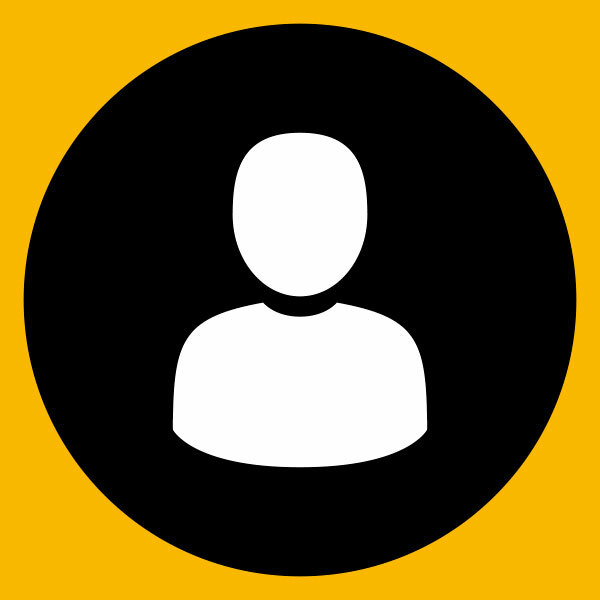 I'm a big-picture, early adopter kind of guy and like to jump straight to the end game and skip all the faff in the middle. I've already invested in bitcoin, ethereum, and some other digital currencies; I've ditched television and source my moving-picture binge sessions from Amazon Prime, Netflix, and YouTube; I don't know the last time I went to a physical store to do any shopping, either. You get the idea. Therefore, after some reflection, it's perhaps a bit odd that it took me 11 years into my official (license holding) motorcycling career to jump aboard an electric bike. Granted, they haven't been commonplace for even half that time, but they've been around long enough. The narrative is often that electric is The Future, yet I have to admit it didn't resonate with me. I didn't shun electric bikes, I just thought they seemed a bit boring. Besides, I had a Triumph Street Triple 675, which is obviously the best bike in the world ever. Then I had the chance to ride a Zero SR for a few weeks back in the summer and it took all of about 10 miles to see how wrong I'd been. My mind was blown when I realised how fast, quiet, and easy to ride it was. But the bigger revelation was far deeper: I learned that the part I like most about riding bikes is actually riding bikes. To be clear, I knew I liked riding bikes, but I attributed a disproportionate amount of that enjoyment to sweet engines and awesome sounding exhaust notes. The Zero taught me that I just like riding. I like tipping into corners, trying to find good lines, and trying to improve with every mile in the saddle. The SR taught me that I get near the same riding pleasure from a silent, torquey, fume-free electric bike as I do a fire-breathing Ducati 1299 Panigale S. Don't get me wrong – a Panigale is special, and riding one is an occasion, but its engine is apparently not the thing that keeps me coming back. My nerdy, bigger-picture mind kicked in and decided, almost on the spot, that as soon as the obvious pitfalls of electric bikes (battery capacity and charge-point availability) are solved, gas bikes will become a thing of the past – in the developed world, at least. 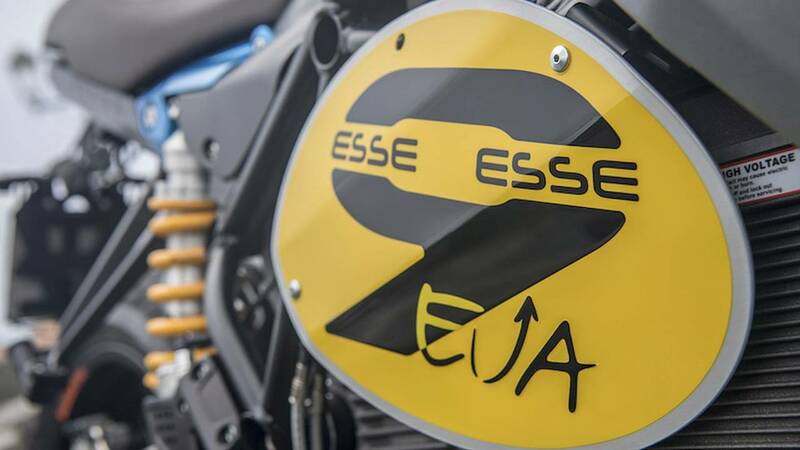 All of this made accepting an invitation from Energica to ride its latest bike, the Esse Esse 9, a complete no brainer. I'd been itching to ride another electric bike, and here was a golden opportunity. Energica is a small firm based in Modena, Italy, with only 40-50 employees. It's part of a larger company, CRP Group, which makes bits and pieces for the automotive and aerospace industry. Digging around a bit suggests it built the gearboxes for the Minardi F1 team a decade or so ago. You'll perhaps have heard of Energica in the news recently, as it has become the single manufacturer for MotoGP's Moto-E World Cup series, which is set to debut in 2019. Now a part of the MotoGP paddock, Energica clearly means business and its street bikes, evidently, are no different. 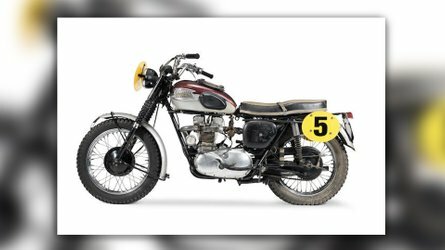 The Esse Esse 9 is named after a Roman road (the SS9) that runs from Piacenza to Rimini through the heart of Italy's "motor valley." It's built on the same platform as Energica's other road bikes. The frame, motor, and battery are the same across all of Energica's models (although they achieve differing amounts of torque, power, and top speed), but the Esse Esse 9 is dressed as a relaxed, easy ride. 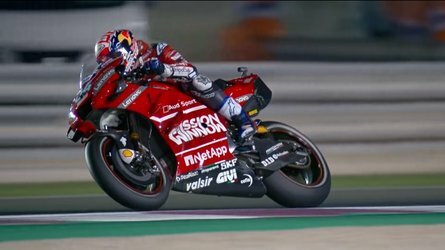 That means a relaxed footpeg position and wide bars with a short reach. 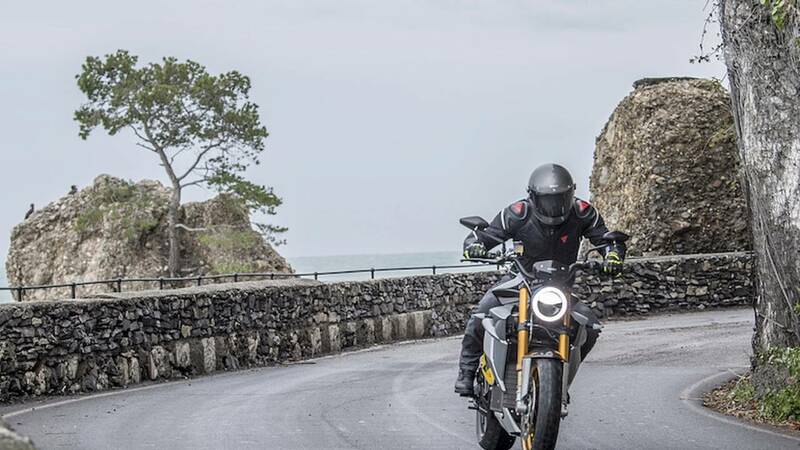 Style-wise, Energica have positioned it as a retro café racer, and that means a single headlight up front and an old-school stitched leather seat. 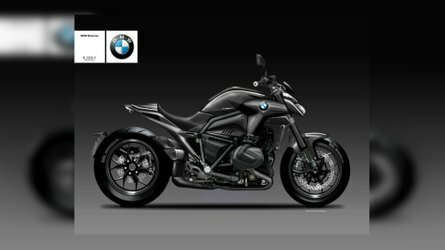 It has been set up to develop 133 lb-ft (180Nm) of torque and 109 HP (80kW), and is limited to 125 mph. Walking around the Esse Esse 9, a few things immediately strike you. 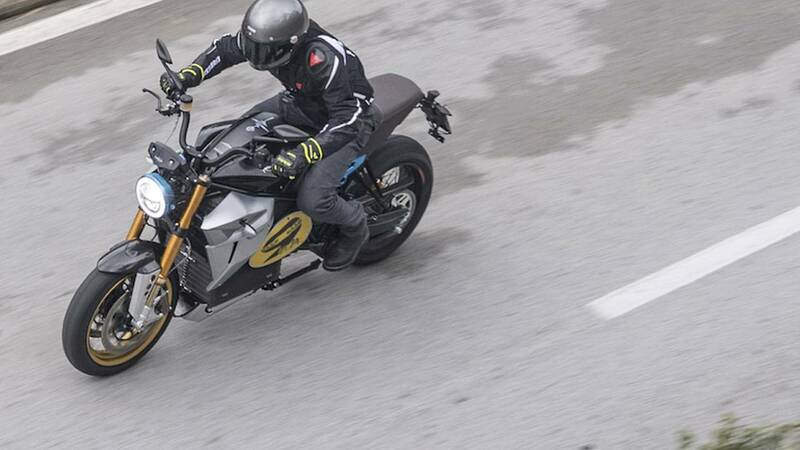 Unlike the Zero, the Esse Esse 9 somehow has the air of a "real," gas-powered motorcycle. I put that down to its physical size; it's proportioned more like a 1000cc bike than a 500-600 like the Zeros. Secondly, everything about the Esse Esse 9 is premium, and often unnecessarily so. You will not find find one one single cheap or shoddy part on it. 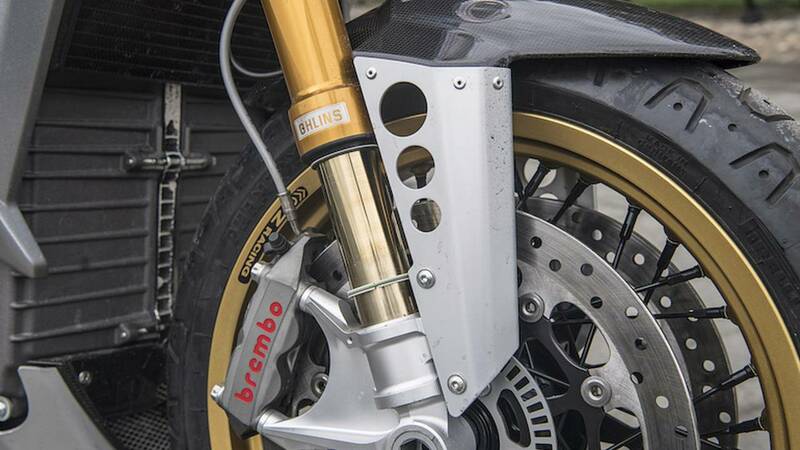 The forks are Marzocchi and the rear shock is by Bitubo, both fully adjustable. The brakes, with braided brake lines, are from Brembo, and the wheels are cast OZ units. 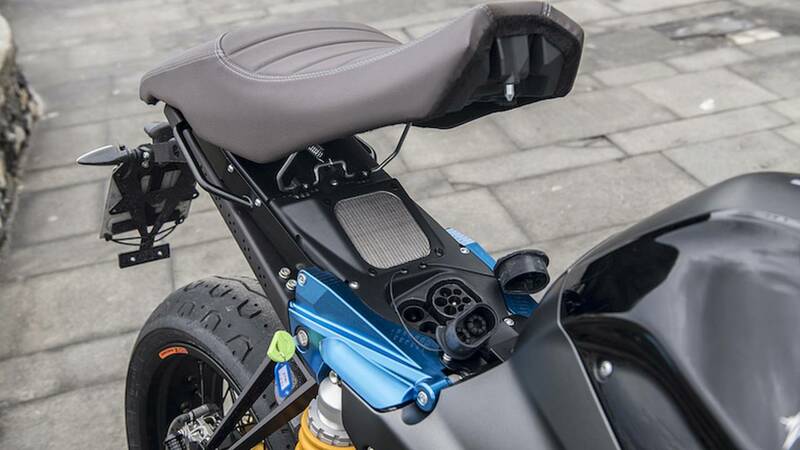 The seat is hand-stitched and real leather, the yolks are CNC machined, and the dashboard looks remarkably similar to the units that Aprilia uses on its V4 bikes. But, remarkably, it isn't just the stuff you can see and touch that's premium; even the stuff you can't see is high-end. Get on your hands and knees and look into the places you usually wouldn't, and you'll find even the smallest and most-hidden of brackets are CNC machined or made of carbon fiber. Those body panels aren't plastic, either – they are carbon, too. All of them. And you won't find a light on it that isn't LED, either. There's a higher spec Special model, too, which comes with Ohlins suspension and spoked Marchesini wheels, plus a bit more of the battery and motor on show. You might've guessed that the positioning and price tag for the Esse Esse 9 is high. It starts at €22,050 (US $26,150, or £19,550) and the special model will set you back €23,690 ($28,100, or £21,010). That said, I can't help but think that, with parts as high-quality as they are, Energica can't be making much of a margin on its bikes. 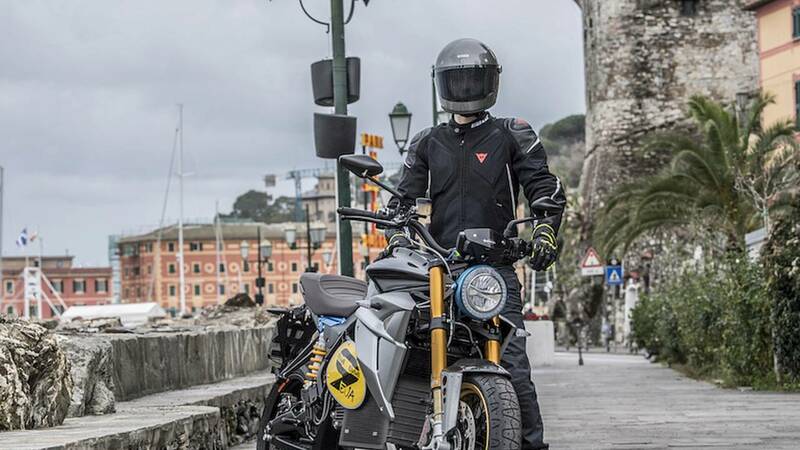 Nevertheless, Energica's staff are adamant that the very upper echelons of the market are where they are aiming, and that they won't ever be producing lower cost, higher margin models. Much to my surprise, riding the Esse Esse 9 is not at all like my experience on the Zero. As mentioned, it's bigger and heavier, by a good 70 kg (150 lbs), and, boy, you can feel that weight when lifting it off its sidestand. Whereas the Zero felt like it held its weight very low down, the Esse Esse 9's weight feels more central. After turning the key, waiting for the LCD dashboard to wake up, holding the front brake on and pressing the "starter" to arm the motor, moving away is as simple as giving the throttle a very slight twist. There's no clutch or gear lever to consider, and the brakes are both where they'd be on a gas-powered bike. The bike moves steadily away and the majority of the weight you felt lifting it off the sidestand disappears in an instant. The throttle's light and very progressive, and possibly the nicest throttle response I've ever had the pleasure of experiencing. The riding position definitely classes as all-day comfortable. The Esse Esse 9 has four riding modes – eco, urban, rain, and sport – each offering an appropriate amount of torque and throttle response, as well as customisable regenerative braking. It's worth noting that there's switchable ABS but no traction control. 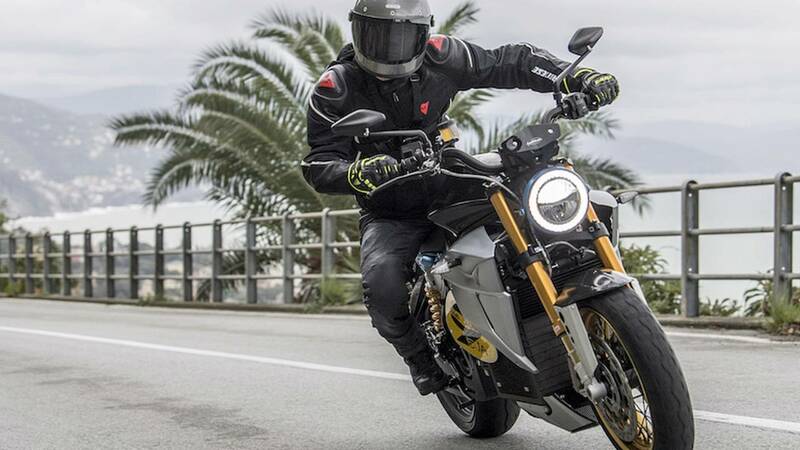 Energica commented that it currently doesn't have a good enough traction control system, so it decided no traction control is better than bad traction control – something I completely agree with. I set out in Urban mode but within a few miles on dry roads switched it into Sport for a sharper throttle response. I played around with all of the modes but, really, in all but the wettest of conditions, Sport is fine for everyday riding. The electric motor is coupled to a fixed-ratio gearbox (it only has one gear and you can't change it), which Energica says has been tuned to output noise at a particular pitch. In other words, it sounds completely different to the Zero. It's hard to adequately describe the noise; it's a high-pitched whirr that I personally think sounds great. It's almost like a jet engine spooling up – the faster you go, the louder and higher pitched it gets. 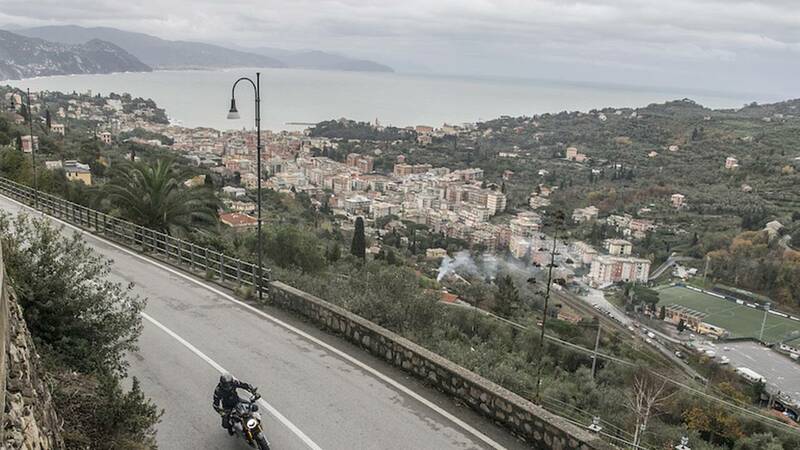 It definitely turned the heads of onlookers as we made our way around the roads in Portofino. Sadly, it only takes a stab of the brakes or a corner taken with enthusiasm to remind you of each of the bike's 258 kg (570 lbs). Manhole covers and potholes are smoothed over by the weight, but fairly large inputs to the handlebars are required to get it pointing in the right direction when getting a move on. It does feel planted, though, and twisting the throttle results in grin-inducing amounts of acceleration as the motor delivers instant torque – huge amounts of it – from any rev. It's everything I liked about the Zero, except bigger and faster and with better noise. I wish I could tell you what the Esse Esse 9 felt like on big, wide open roads, and fast-flowing corners but sadly the test route and schedule didn't allow. The electronics package is decent for, er, an electric bike. The dashboard has an integrated data-logger that'll graph power usage over time and generally the dashboard is a rich – if slightly cluttered – display of all the information you could ever want. It's got three display modes, offering a different presentation of speed, battery power, motor rpm, etc, and syncs up to a smartphone app that'll perform diagnostics and show you on a map where to find your nearest EV charging station. 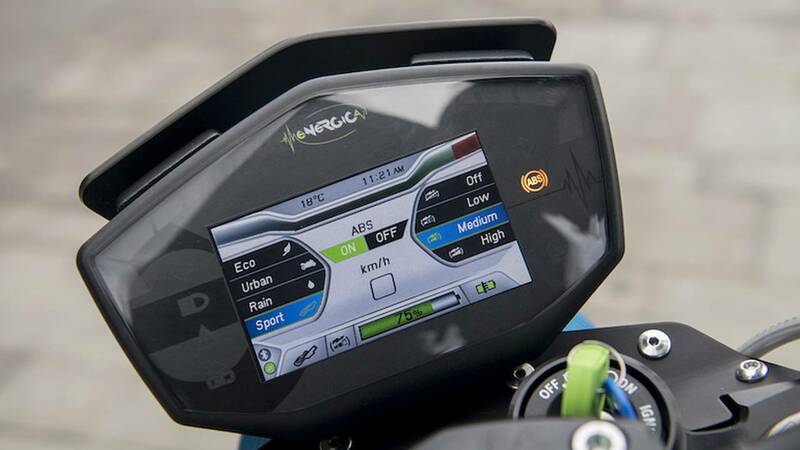 The LCD dashboard display is OK, and is operated from controls on the left handlebar, but it's not nearly as big or crisp as you'll find on the latest bikes from Ducati or KTM. Flipping the seat up reveals the bit you really want to know about: the charging port. 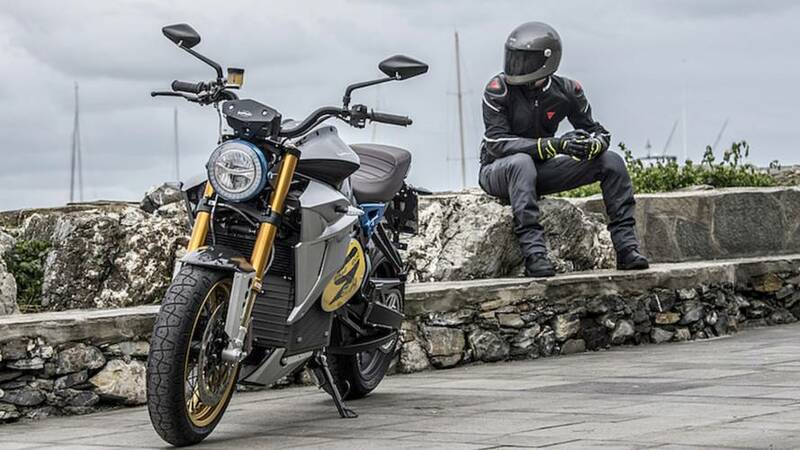 The Energica is presently the only electric bike to use the CCS type charging port - the same that you find on electric cars - which means the Esse Esse 9 can be charged fully in 30 minutes. That's impressive in my opinion, but hinges on your ability to find a fast (mode 4) charging station, the availability of which will vary wildly between cities, states, and countries. Otherwise, it's a four-hour charge on a standard (mode 2 or mode 3) EV charging station or domestic outlet. Battery range is a big and interesting topic. 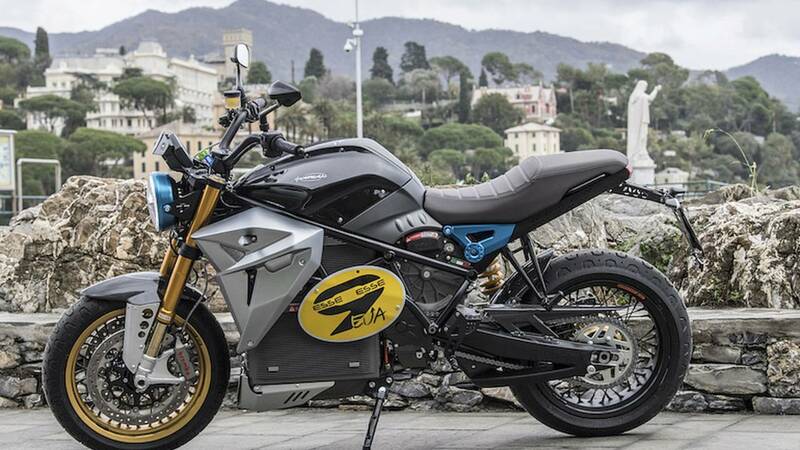 Energica claims you'll see 93 miles with varied riding. Based on my ride, I believe that's probably accurate. Ride like a tool and you'll easily reduce that to 50 miles or less. The bigger issue in my mind is the battery's lifetime performance. 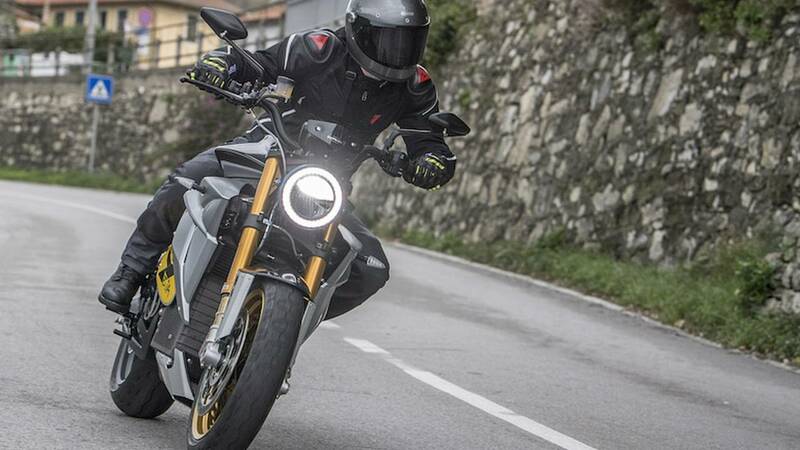 Energica guarantee the battery for 31,000 miles (50,000 km) and claim it can withstand 1,200 charging cycles before its capacity drops to 80 percent (at which point – if smartphones are anything to go by – it'll be useless). That might sound good, but I'm wary of the effect time has on batteries. A seldom-used battery left for long periods is not going to work particularly well after 5 years or so, and won't be cheap to replace. The aforementioned nerd and the big-picture futurologist in me loves the Esse Esse 9, and electric bikes in general. As the saying goes, any idiot can make something more complex but it takes a genius to make something more simple. And that's what electric bikes are: simple. I vividly remember standing in Ducati UK's workshop at Silverstone watching an engineer working on a 1299 Panigale R – guts of the beast, oil, and tools everywhere – who turned around and looked at me as if to say: "There has to be a better way than this, right?" Energica's Esse Esse 9 and the platform it's built on might be that way. It is clearly incredibly sophisticated, virtually maintenance free, and a cut above other electric alternatives. The level of componentry, from the LCD dashboard to the luxury suspension and carbon-everything, is unrivalled in this market. I'm glad there's a bunch of people out there making all-singing, all-dancing fancypants electric bikes. It adds legitimacy to the electric bike market. Unfortunately, though, I can't have my future now. The bike's price tag is partly to blame, but there are also factors beyond Energica's control. For example, in central London, where I live, there are only three super-fast charging points. The next nearest are 50 miles away in Oxford; you'd better hope they aren't occupied when you get there, or you're in for a long pitstop. But I know that with time, that'll change. So will battery technology, which will batteries getting more range or smaller physical size - hopefully both. Where does Energica fit into the bigger picture? Right now, it's for rich guys and girls who only want to ride relatively short distances or commute on very expensive bikes. 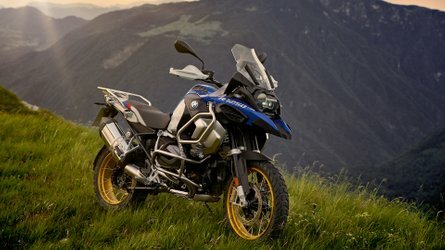 That's fine, but it seems a waste of such a fantastic bike. Meanwhile, the rest of us can hope that, via things like Moto-E World Cup, sufficient development will be made over the next half decade and the trickle-down effect will do its thing. Because, hell, we should all want these things – just at half the weight, half the price, and double the range.